In 1998, 20 years ago, I owned my first mobile phone, a Nokia 8110. And now, 20 years later, it’s back! HMD Global is taking me on a journey back in time with the bright yellow Nokia 8110 4G. It’s like being 20 again! So beautifully small, so light, and finely curved: The Nokia 8110 4G feels pleasantly familiar from the first touch. Well, the cover above the keys is a little rattier than I remembered, and the display is almost huge - and colorful! - but everything else is as wonderfully simple as ever. In the past, cellphones weren’t only light and small, but also terribly slow, although they didn’t need to be fast because they couldn’t do anything. That’s not quite the case for the Nokia 8110 4G, but the device does tend to be quite fast in the browser, but otherwise the phone seems pretty slow in comparison to other devices that make their way through my hands. Again and again I have to wait for my cursor to jump, or even worse, the 8110 no longer reacts at all. But the good thing is that I have a trick at my disposal that I don’t have with other smartphones: just take the battery out, put it back in, switch it on, and everything is fine again. I really had a hard time with how the device operates. How on earth did we ever get by with these T9 keyboards before. It’s just impossible. There’s also no touch screen. It doesn’t help that the Nokia 8110 show a mouse cursor on some apps, which you move with the control pad. It jumps back and forth at such wild intervals that it’s sometimes impossible to hit the button you want to press - it just always jumps around. And the control pad, which my old 8110 didn’t have, is a disaster. It’s far too and too fiddly, and is hardly sensible to use. Apps are all anyone talks about now. That didn’t use to be the case, but now it is. And the Nokia 8110 4G comes with Google Maps, Google Search, Youtube (!) and even Google Assistant (!!!!) preinstalled! That’s terrific, since you can even use Assistant without logging into Google. 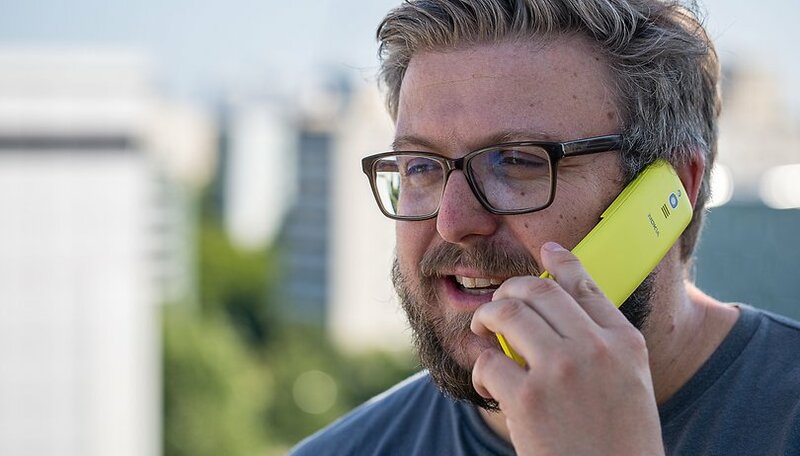 The Twitter app is one of less than ten apps in the Nokia 8110 store and will connect you to the world of social media - great! If I could get Facebook and WhatsApp on the device, I’d almost be satisfied (for the time being). I already think it’s great how the battery performs. You don’t notice it at all. I charged the Nokia 8110 on a Friday, and then on the following Monday it’s hardly lost any charge. That’s awesome! But with two active SIMs it will look different. It doesn’t bother me that HMD Global did without the stub antenna on the old 8110 for the new edition. I can easily get over it, after all there is now a micro-USB port, a (terrible) camera and a minijack port. Let’s see how long my journey into the past with the Nokia 8110 will last and when all the nostalgia wears off. But, please excuse me, I have to get back to playing Snake! What was your first mobile phone, and would you be happy about a new edition? There is a technique to use T9 keyboard to text fast. It's called multi-tapping which admittedly I was not familiar but now am hanging the hang of it. If you overshoot a certain alphabet/digit, just keep tapping and it cycles back to the start (instead of amending the mistake). You can advance to predictive texting which is even faster but I don't prefer it as I use multi-languages in texting for my multi-racial country. have the black version, the reseller forgot to mention it was not the dual sim version.